While Russia fights for its cultural identity, the White House is fighting for “the promise of the hashtag.” One simply needs to flip through a history book to see how Reagan, Thatcher and Pope John Paul II dismantled the Soviet Union in order to realize that President Obama should have stuck to “organizing” Chicago (i.e., Chiraq). 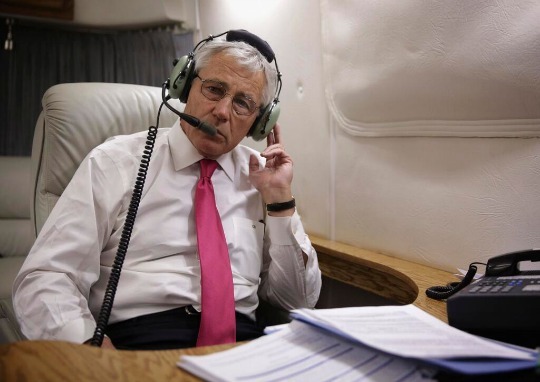 Is it any wonder why the Kremlin won’t take calls from Defense Secretary Chuck Hagel? Defense Secretary Chuck Hagel has been unable to get Russian Defense Minister Sergei Shoigu on the phone amid escalating tension near the country’s shared border with Ukraine. Mr. Shoigu announced Thursday that Russia planned to engage in a new series of military exercises near the Ukraine border. The military move, he said, is in response to ongoing NATO training exercises in Poland and the death of at least two pro-Russia insurgents in eastern Ukraine. The White House is getting shellacked on the world stage, and Americans have no one to blame but themselves. So far, speaking with “one voice” hasn’t done much to deter Russian aggression, even as part of a broader campaign to punish Moscow for its behavior. … U.S. officials and legislators have unanimously ruled out a military response to Russian aggression. So you’d be forgiven for considering the State Department’s social media campaign to be a somewhat Quixotic, ephemeral even, effort at building a response to Russia’s moves in Ukraine. For anyone writing an early obituary of U.S. diplomatic efforts in Ukraine, here’s your headline: “The Promise of Hashtag.” The ease with which Russian diplomats have hijacked the banner under which sundry U.S. officials have been tweeting about Ukraine also speaks to the danger of using a slogan that essentially lacks content. What does it mean to be “united for Ukraine”? It certainly sounds good. Both words begin with a “u.” And who doesn’t like “unity”? But combing the two words with the preposition “for” doesn’t add a great deal of meaning. Then there’s this: It’s no small irony that the Russian Foreign Ministry managed to express itself in more coherent English than the State Department’s chief spokesperson. I’ve said before that the president was propelled to great heights by his talent for eloquently delivering soaring vagueness. The man who preached “hope and change” got people who get excited over “Obama cares” bumper stickers to vote for him twice, and guys like Vladimir Putin couldn’t be happier. The Russian Foreign Ministry speaks better English than the State Department because it knows exactly what it wants — and its willing to use force to get it. Russia is not interested in being an “also ran.” It has a rich and proud history, and it will fight to regain what it believes to be its rightful place on the world stage. Meanwhile, we have a president who laments the fact that the United States isn’t just one random voice among many on the world’s stage. He bristles as phrases like “American exceptionalism” and chooses, whenever possible, to drag the skeletons out of our closet for all the world to see. One could almost forgive the man if his foreign policy was even remotely coherent. Instead, Americans get “reset” buttons (misspelled as “overcharge”) and Ashton Kutcher diplomacy. Perhaps you, like me, were forcefully encouraged to see the new movie “Valentines Day” last weekend. In the course of diplomacy, perhaps you, too, said that it was a wonderful movie. It seems that no special time has been set aside to discuss hacking, censorship or blogger imprisonment. How did that work out for us, Mr. President? How much bang for the diplomatic buck did we get for sending Ashton Kutcher over to Russia to dicker around with the Russians and talk about how widgets and gadgets and Twitter hashtags are really, really awesome? Compare and contrast Ronald Reagan’s handling of Communists with the Obama administration’s “reset” (i.e., “overcharge) diplomacy. The. Promise. Of. The. Hashtag. Some things are so ludicrous that they are beyond satire. The rest of the world realizes that Obama is a buffoon, while the limousine liberals in Hollywood and the news media cling to their mantra that he’s the smartest guy on the planet and always the coolest guy in the room. It’s always kind of amazed me how many people can’t see that the “suave,” “cool” Obama were campaign creations propped up by the media. It’s well-known that although Democrats will defend him because he’s a Democrat, that he isn’t well-liked by members of Congress. Yes, he’s so cool that … no one from his past remembers him or is willing to talk about him. College friends? Classmates? Childhood friends? No one wants to talk about the guy. Yes, he’s so smart that it would take Tom Cruise’s Ethan Hunt to even have a chance at viewing the guy’s actual college transcripts. If he was really as smart as the media says he is, his transcripts would be plastered all over the place, memes would be made with his grades next to Bush’s, etc. And yet, they remain on lock down. Interesting. I never fell for the “suave/cool” Obama stuff pushed by the media, even though far too many in my generation did. I knew that was a charade from the beginning… I was thought he was arrogant and inexperienced. It’s amazing how he won’t release his college transcripts… that indicates to me he might not be as smart as the media and his fawning supporters think he is. He’s an embarrassment and the rest of the world laughs at his incompetence. If he would’ve been President during the Cold War, I’d say we’d have lost and we’d all be speaking Russian right now. 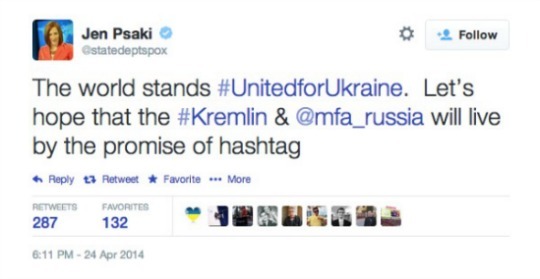 Like Tom said, the “promise of the hashtag” (I hate hashtags) is so ridiculous that it’s beyond parody. Embarrassing and hilariously bad. Proof that real life is stranger than fiction. I cringed at the “reset button” video with Hillary. How anyone can take that sort of diplomacy seriously is beyond me.